With more and more internet providers now bundling other services with their core broadband products, such as power or mobile phone we have whittled the entries down to two finalists. The Broadband Compare Awards judging panel will have a tough job picking a winner between these two great finalists. Thanks to all of the entrants and congratulations to the finalists. 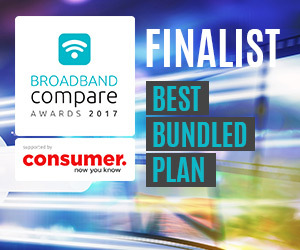 We look forward to presenting the Broadband Compare Awards Best Bundled Plan trophy to the winning internet provider at the Awards evening taking place at the Sapphire Room, Ponsonby Central, Auckland on the 2 November.